Be the most popular summer party host on the block with recipes for our 50 best summer appetizers. From beer battered oysters, to our best bruschettas, dressed-up deviled eggs, savory seafood and satays, and the ultimate guacamole recipe, there are summer starters here for everyone to love. 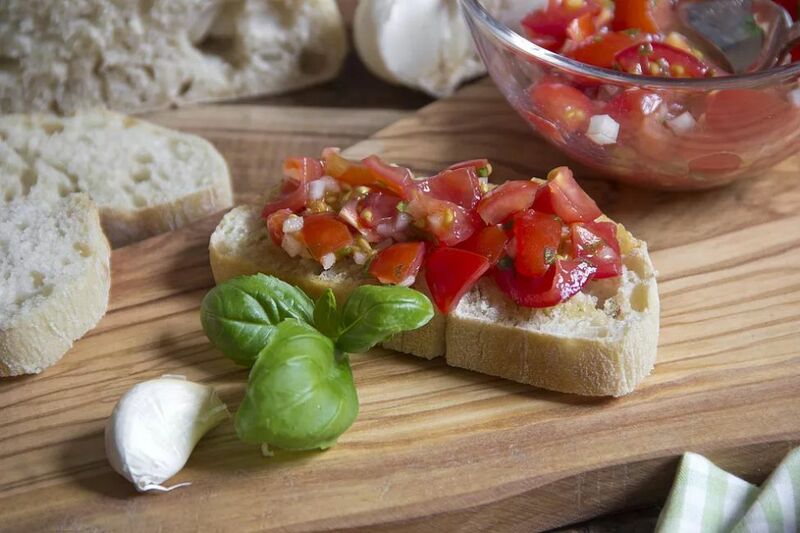 Top crusty, grilled, garlicky bread with fresh, juicy tomatoes and aromatic basil leaves to make this simply delicious summer appetizer. Be sure to read below the recipe for great ideas and tips for variations. Flautas are crispy, flute-shaped rolled and stuffed tortillas that make a great summer party appetizer. In this version, fill flour tortillas with green chiles, corn, and tangy cheese for a tasty array of summery flavors. The salty, meaty taste of Serrano ham is a natural match for sweet, mild honeydew melon in season. Assembled simply on toothpicks, this is a super easy appetizer to prepare, with zero cooking required. Do you have lots of garlic growing in your garden? Bake up a big batch of pizzeria-style garlic knots in your oven. This easy recipe is made with prepared pizza dough, so it's fast and easy enough for kids to help with. Ceviche is a refreshing seafood dish made with raw fish that is cured with citrus juices. This easy, stunning, no-cook appetizer recipe uses chunks of buttery salmon, blending it with orange, lemon, and lime juices, slices of mango, red onion, soy sauce, rice wine, jalapeños, for an explosion of summery flavors. Spicy, saucy chicken wings are always popular starters at summer gatherings. These are flavored with a refreshing marinade made of garlic, lime juice, and chilies. It is tangy and has a nice kick of heat. Take your hummus party dip to the next level with this inspired appetizer recipe, which blends creamy, ripe avocado with canned chickpeas, tahini, garlic, lemon juice, and chopped fresh herbs. Serve with pita triangles for dipping. Hosting happy hour at your house? Serve up this well-loved crunchy, creamy, spicy restaurant-style appetizer. Stuff hot jalapeño peppers are stuffed with cheese, rolled in a crunchy breadcrumb coating, and deep-fried until golden brown. Easy, oven-baked Thai coconut shrimp are always a hit with guests. Shrimp are simply coated in coconut flakes and seasoned panko breadcrumbs, then baked on a cookie sheet, for serving with store-bought Thai sweet chili sauce. Crispy, golden fried oysters with a cornmeal coating are a welcome addition to any backyard or cottage party, and taste fantastic enjoyed with cold beer. Serve them with the zingy tartar dipping sauce. Beach bread is a popular South Florida appetizer recipe that takes garlic bread to a new level of indulgence. Thick baguette slices are topped with blue or Gorgonzola cheese, tomatoes, chives, mozzarella, and parsley, and baked until melty. Yum! Guacamole is one the best loved appetizer dips, and this is the classic recipe everyone will love. Make it to your tastes, with or without optional cilantro and chopped tomatoes. Just don't forget the lime juice! Hello, is it cheese you're looking for? This retro-inspired cream cheese ball gets delicious sweetness from pineapple chunks, and tons of crunch from the chopped pecan coating. Serve with raw veggie sticks or crackers on the side. This recipe makes great use of zucchini from your garden. Slice vegetables into rounds, coat them in parmesan and breadcrumbs, and crisp in the oven, for a healthy, crispy appetizer. Fattoush is a warm, Middle Eastern bread- and vegetable-salad, similar to Italian panzanella. This tasty version includes garlicky sauteed asparagus spears and tomato chunks, along with lightly toasted pita pieces, zesty lemon juice, and tangy ground sumac. Southern cookouts call for hush puppies! These fried balls of cornmeal goodness are made with beer in the batter, for a light and crisp texture. Add some diced jalapeños, or a few dashes of hot sauce, if you like your puppies with extra spice. Create an impressive appetizer for your summer cookout parties with gorgeous, colorful beet deviled eggs. Make them easily 3 or days ahead of your event, to allow time for eggs to pickle, and develop their flavor and color. Scrumptious, golden-brown corn fritters are an essential summer barbecue snack. This gluten-free, vegetarian recipe makes the best fritters ever, with tons of flavor and creaminess in the filling from fresh corn, tofu, green onions, coriander, bell pepper, chili, and turmeric. Crispy fried calamari is even more delicious with Thai flavorings. It's fairly easy to prepare, even if you've never made squid before—just slice, dip, and dry. Serve with store-bought Thai sweet chili sauce for dipping. Fig crostini is an elegant appetizer that's worthy of special gatherings. Toss chopped fresh figs with high-quality balsamic vinegar and black pepper, and eat them on slices of toasted baguette. Your outdoor grill brings out a fantastic, smoky flavor in sweet summer corn. Here, the kernels are tossed with tomato, red onion, avocado, fresh herbs and seasonings, and optional feta cheese, for a scrumptious salad. With only 5 ingredients and no cooking required, this easy pineapple salsa is sure to become a go-to recipe. Use it for topping grilled fish or scallops, as a condiment for barbecue pork, or a relish for chicken burgers. Sweet, juicy pears make a great partner for salty, cured ham. Wrap pear wedges in proscuitto and broil them briefly to crisp the meat and soften the fruit, for a lovely, warm bite. Serve with this balsamic candy drizzle. Create a different kind of caprese salad by replacing fresh tomatoes with juicy watermelon in season. Crunchy watermelon cubes mingle with creamy, soft fresh mozzarella and aromatic basil leaves, all slathered in a rich balsamic syrup. Wrap strips of salty bacon around bite-sized, Creole-seasoned chicken cubes, secured on toothpicks, and bake them in the oven. Soak the toothpicks in water before load them and put them in the oven, to avoid scorching them. Thai basil chicken lettuce wraps are a fresh, tasty, hand-held appetizer. When serving a crowd, place the lettuce leaves on their own plate, beside the delicious chicken filling, and let guests assemble wraps themselves. Vegan cucumber spring rolls stuffed with crunchy vegetables and fresh herbs are a refreshing cold appetizer for hot summer days. Serve with some peanut sauce, chili sauce, or soy sauce on the side for dipping. Watermelon gazpacho is a wonderfully sweet, no-cook, cold soup that makes a refreshing starter for summer meals. Serve it in a pitcher for guests to pour into glasses, or pour into martini glasses for a festive presentation. Tasty shrimp appetizer skewers are great for enjoying with a glass of rum punch at summer backyard events. They cook quickly in just minutes on the grill, after marinating for an hour or more in a delectable rum, honey, ginger, garlic, and lime sauce. Fresh cucumber rounds stuffed with sun-dried tomato pesto are simple to prepare, and make an elegant presentation on your appetizer table. You'll need a food processor or hand mixer to prep the filling, and a melon baller for scooping out the cucumber centers. Sweet, sour, spicy, nutty, and crunchy, this delicious, refreshing Thai green mango salad will please every part of your palate. Wrap it in radicchio or romaine leaves for a hand-held party app, or serve in bowls for a more traditional starter. Grilling the eggplant takes this garlicky, Greek-style appetizer dip to a whole new level of intense flavor. Serve it with crackers, bread sticks, or raw vegetables for dipping. Quick pickling brings out the natural sweetness in plump, low-calorie shrimp, and you can vary the herb mixture to suit your tastes (or to use whatever is growing in your garden). Serve on toothpicks for an easy, hand-held appetizer. Grilled oysters have a fabulously rich, smoky flavor that is out of this world. This recipe walks you through how to cook oysters easily on your grill. Serve topped with compound butter, fresh relish, or a splash of hot sauce. Impress family and friends with these elegant little stuffed mushrooms. They are filled with a delectable, buttery crab meat and breadcrumb stuffing, and spiced up with Cajun flavorings. Please a crowd with a big bowl of creamy, gooey, garlicky, warm spinach and artichoke dip. Make it a day ahead to make party prep easier, and bake it just before guests arrive. Serve with crackers and baguette slices. Wow guests with these smoky, cheesy, well-seasoned, restaurant-style stuffed potato skins. They start in your oven, and you finish them in your BBQ smoker. Add a crumble of bacon on top, if you like, for extra meaty flavor. You don't have to wait for tomatoes to ripen to cook this classic Southern appetizer. Dip tangy green tomato slices in eggs and coat them with cornmeal, then fry them until they are crispy and golden. Zucchini is abundant in summer, and these easy, quiche-like appetizer squares make delicious use of the nutritious vegetable. They are a snap to bake up in your oven, with biscuit mix, parmesan cheese, eggs, onion, and pantry spices. Prepared pizza dough makes it easy to serve up these much-loved pigs in blankets, with a simple, 2-ingredient apricot-mustard dipping sauce. Slice them into rounds for appetizer trays. 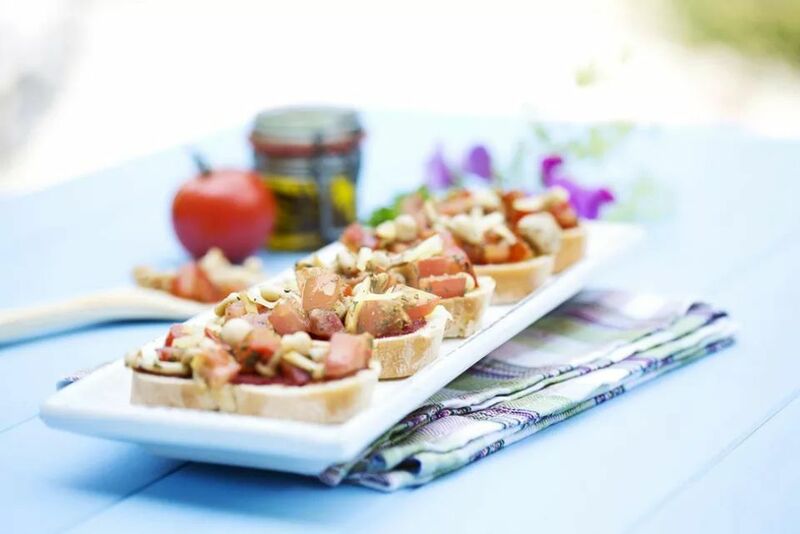 Everyone loves crusty grilled bruschetta, and this sophisticated version with buttery, garlicky chunks of crabmeat, salty parmesan cheese, and fresh chopped parsley is sure to wow your summer party guests. Kohlrabi, zucchini, and cucumber are all at their best in summer, and have the perfect density and texture for spiralizing in a salad with zingy mustard-horseradish dressing. No spiralizer? You can use a vegetable peeler instead. Crispy eggplant fries are crunchy, tasty, and make a healthier alternative to French fries for serving with grilled burgers. Coat eggplant strips in a breadcrumb crust, and deep fry them until golden and crispy. You don't have to be a vegan to enjoy this tasty, protein-packed, gluten-free summer salad. Black beans and mangoes mingle with chopped bell pepper, jalapeños, and fresh cilantro, in a simple, zesty lime and olive oil dressing. Classic Greek spanakopita is made with store-bought flaky phyllo dough, layered with a savory, seasoned mixture of spinach, onion, feta and ricotta cheeses. Cut it into wedges or triangles to make a tasty, hand-held appetizer. Chicken satay with peanut sauce is a favorite party snack that's simple to make at home. The secret to great flavor is letting the chicken marinate in the spice mixture for at least 3 hours before loading it onto skewers and grilling. With its vibrant red color, and sweet and nutty flavor, this nutritious, protein-rich beet humus recipe will be a stand-out on your summer buffet table. Serve with crackers or tortilla chips for dipping, or as a bright crostini topper. Pimiento cheese spread is a popular Southern appetizer that you can make at the last minute, whenever guests are dropping by. Combine sharp cheddar cheese with cream cheese, pimientos, mayonnaise, and your favorite hot sauce. Crunchy, irresistible Tex-Mex style taco bites are made by tucking your favorite taco ingredients into muffin-tin tortilla cups, and baking them until they're piping hot. Omit the ground beef to make them vegetarian.